Generally, professional designers don’t like crowdsourcing. We hold little enthusiasm for so-called “opportunities” offered by profitable companies to submit work—for free, of course—in hopes of winning their approval (like when Dog é Style Restaurant announced its logo contest). In most cases, crowdsourcing results in companies taking a lot for themselves and giving very little to designers. The New York Public Library (NYPL) is “chronically underfunded,” as PCMag says in this article. Yet, the 105-year-old public institution initiates brilliant crowdsourcing programs that benefit the givers (doers) and much as the receiver (NYPL). Take, for example, What’s On the Menu?. 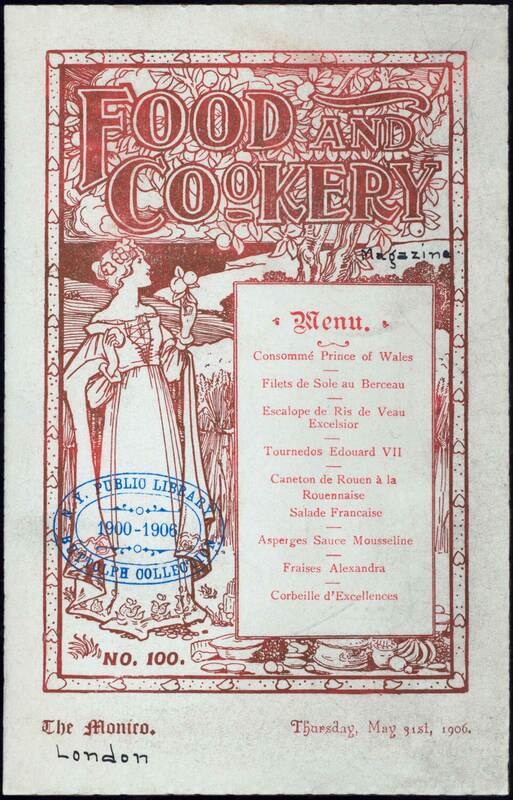 Launched in 2011, this epicurean’s delight crowdsources the transcription of 45,000 historical restaurant menus, which, by virtue of their type and design, are indiscernible to optical character recognition when digitalized. To date, online volunteers have transcribed more than 1,331,929 dishes from 17,545 menus. In return? We, the people, whether we volunteer or not, are given viewing access to NYPL’s magnificent collections. That’s right, 187,000 public domain images for digital download. For free! For artists, historians, educators, scientists, well, for everyone, this is an unimaginable treasure trove. Oh, the glory of it all! In celebration of this release, NYPL invites us to participate in its Labs Remix Residency. Yes, this is crowdsourcing of sorts (the PR will certainly generate donations). And yes, it’s a contest. But once again, NYPL puts the people back in public and offers us something in return—creative use of 187,000 images! NYPL invites us to brainstorm “transformative, interesting, beautiful new uses” of its digital collections. They’re looking for projects that use pre-existing works to create new things (you know, a remix). Maybe a menu? Maybe a quilt? Maybe a board game? They encourage us to surprise them! Here’s another way NYPL is unique in its crowdsourcing: Participants are only required to submit a proposal of their project. From there, NYPL will choose two proposals and award them each a $2000 stipend for completing their project. How cool is that? Start brainstorming! Proposals are due February 19, 2016. Looking for ideas? Here’s a good article. In fact, any one of the NYPL blogs is a good article! Want to show your appreciation for 187,000 free images? Consider donating to NYPL or your own local library. Libraries offer us so much! I just found this post and was fascinated by the NYPL information. What a tremendous find to see all these items, all thanks to your post. I will be sharing this with my children later today and hope they are as enthused as I am. Thanks Johnny! It is pretty cool, isn’t it?